It is a mall, located in the middle of Cihampelas Street. Different from many malls that we find in big cities, Cihampelas Walk is a modern shopping center built in combination with a beautiful outdoor landscape. At Cihampelas Walk, visitors can buy and eat at modern stores and restaurants and at the same time enjoy the nature surrounding the mall. When it was built in 2004, the developer maintained the trees that had been growing for decades in the area and even planted new trees to create a natural atmosphere surrounding the mall. People can walk from one part of the mall to another passing through beautiful gardens. There are around 150 fashion stores, cafes, restaurants, food court, cinema, playgrounds and game centers inside the mall. A wide selection of clothing products are offered at the fashion stores, while the restaurants serve various kinds of dishes, including Indonesian traditional or international cuisines. Many people come to Cihampelas Walk just to take a rest after visiting various tourist destinations in the city or to meet friends at coffee shops. There are a number of coffee shops at the mall. During the day, you may see people shopping and eating at the mall. In the evening, the atmosphere is different: You’ll see people enjoying night entertainment facilities at the mall. 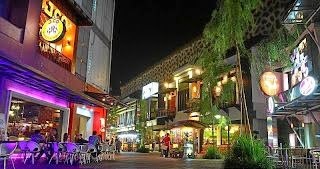 For tourists who want to enjoy the nightlife of Bandung and its evening cool weather, Cihampelas Walk is the right place to visit. Cihampelas Walk provides wide spaces for parking It has even allocated special parking lots that can accommodate eight tourist buses. Cihampelas Walk has been growingly become a new icon of the city.